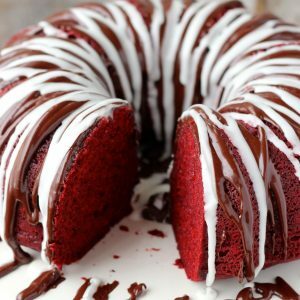 Valentine’s Day is full of cute cupcakes and cookies, but what about a simple and delicious treat that’s beautiful, but not so high maintenance… This Red Velvet Sour Cream Bundt cake is just for you! 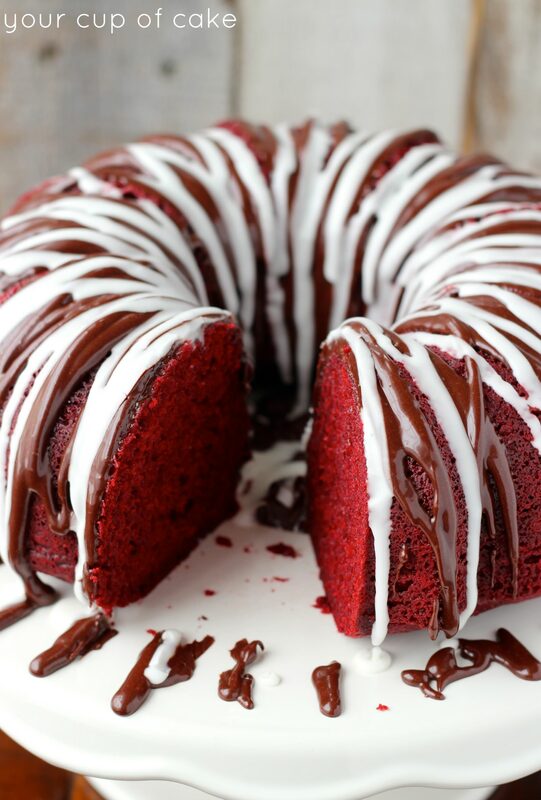 Not that there’s anything wrong with Oreo Red Velvet Cupcakes or fun cookies, but Bundt cakes are just SO easy and you can even fill up the little “hole” with fruit to make it look really gorgeous. I’ll forgo telling a story today. My father thinks my spree of dating stories in the theme of Valentine’s Day sounds “desperate”… which I’m not! I just think being single is a funny time of life full of hilarious situations! 1. Preheat oven to 350 degrees and generously grease Bundt pan. 3. Add pudding mix, egg, oil, sour cream, milk and vanilla and stir until smooth. 4. 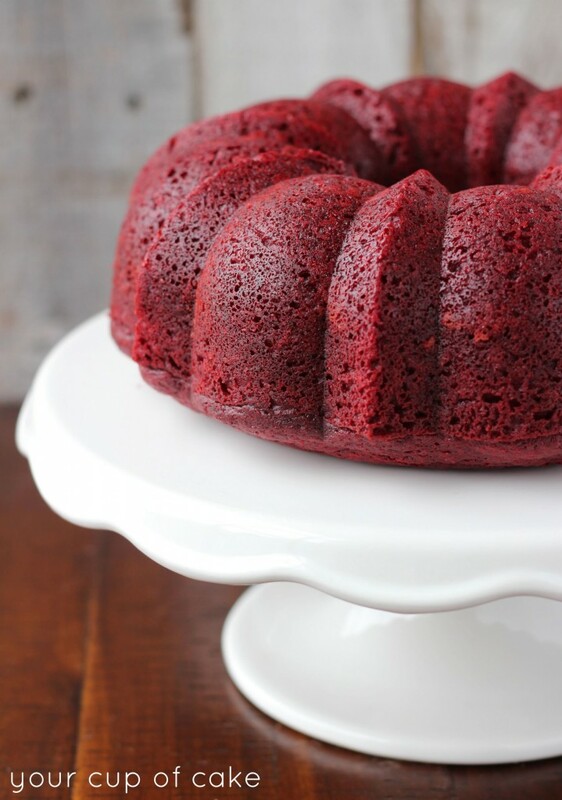 Pout into Bundt pan, spread out evenly and bake for 45-55 minutes or until an inserted knife comes out clean. 5. Make each glaze in a separate bowl using a whisk to combine ingredients. Use more or less milk or powdered sugar to make thicker or thinner. Pour over cooled Bundt cake (I put each glaze in a plastic bag, snipped off the corner and drizzled it on). 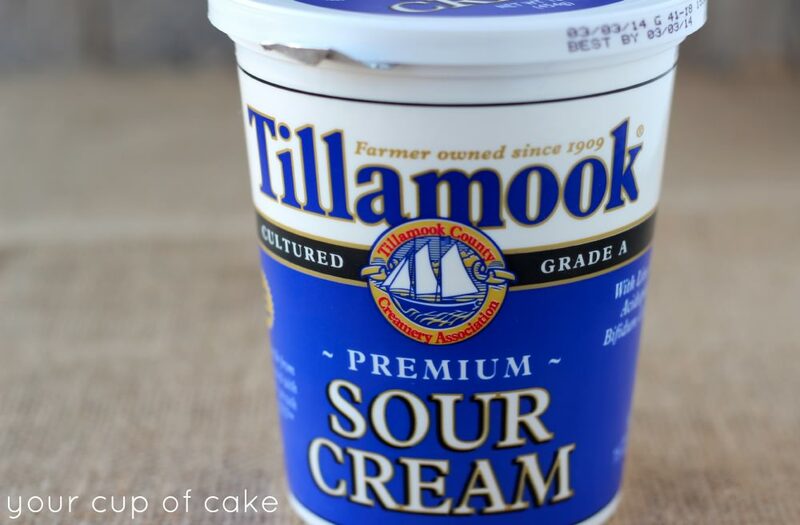 This Northwest girl always uses Tillamook stuff, it’s an addiction. Hi Lizzy! This cake look delicious!!!! I am gluten-free, do you have a Red Velvet Cake mix substitute? Or a recipe I could use? Thanks! 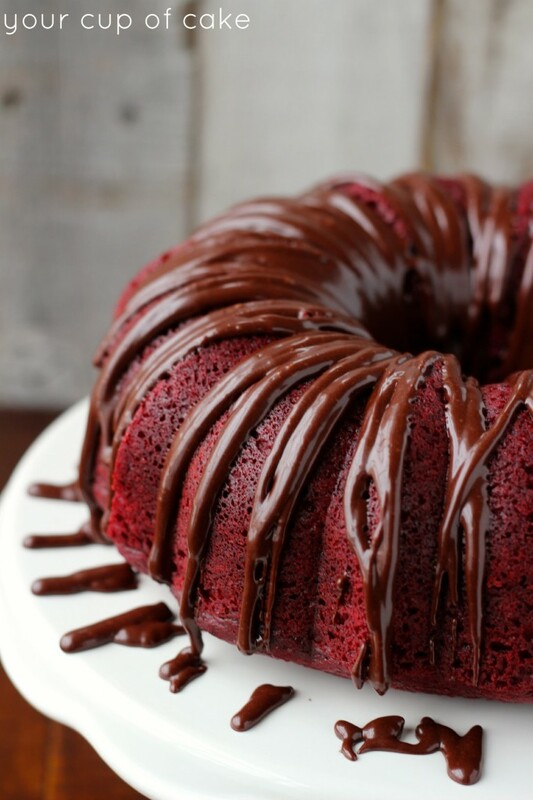 Use a yellow or white Gluten Free Cake mix, add 1 Tablespoon cocoa and lots of red dye! That’s really the easiest substitution! like how your recipes print off. As someone else mentioned a couple of weeks ago there is a large space between the picture and the recipe necessitating using 2 pages instead of just the i page and besides it does not look attractive. Sorry! I’ll keep looking into that issue, it’s a been a crazy last few weeks! 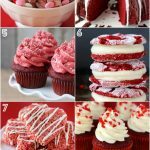 I want to make these as treats for my neighbors for valentines day. 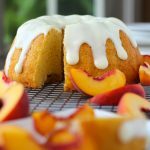 Would this recipe be ok to make in the mini bunt cake pans? How much batter do you think for each cake? I am not very good at baking but want to give these a shot. These turned out so yummy!! Thanks for sharing!! Did I miss which size box of pudding to use? The bigger or smaller one? Thanks – can’t wait to bake this for the fraternity house I cook for! The smaller one! Usually serves 4 people it says on the box! Is it OK to use any type of pan? I don’t own a bunt but have a metal wilt on cake pan? Yes! Just adjust your baking time based on the thickness of the cake! Thanks! 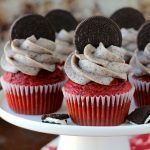 Using box mixes also makes it easy to make things gluten free with GF cake mixes! Can I replace any of the oil with coconut oil? If not, what do you suggest I use coconut oil for? I have no idea how to use it in every day things. 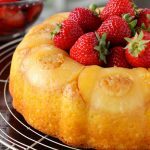 Does the cake need to cool completely before putting the glaze on? Unless you make your glaze thick, yes, I would let it cool! Do you have to add the sour cream? Can you taste it? Red velvet cake is my daughters fav so I just made this for her for Valentines Day. Thank you. I just need to ask a question, do you use the instant pudding left as a powder or do you use the direction on the box . This is on the red velvet scour cream bundt cake ?? We tried this cake out a couple of weeks ago and it was such a hit, we’ve made at least 4 since then. I have my grandmothers original bundt pans and the cake turns out perfect. We took the latest cake made last evening to a dear friend who lost her husband. She told us today at the funeral visitation how wonderful the cake tasted and that it was perfect for all of her grandchildren who’d come in from out of town. Thank you so much for a wonderful recipe! Oh thank you so much! I’m happy bring share all the recipes I have! Thanks for the great recipe! I have made it for my family a few times now and they LOVE it! What size bundt pan was used in this red velvet sour cream bundt cake. 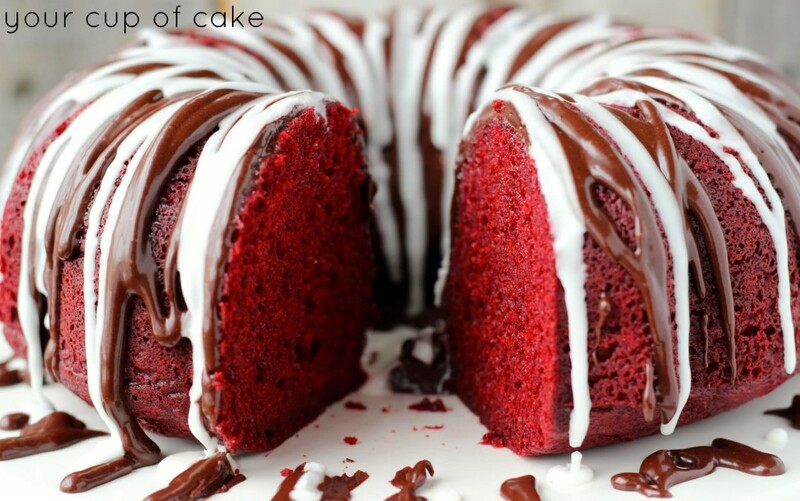 This looks delicious as a bundt cake!! I wonder if you think it could be used for making cupcakes, AS IS? 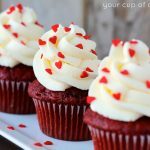 I have to make 200 cupcakes and have been looking for a moist red velvet cake recipe that can be used for cupcakes without having to tweak the recipe. I look forward to hearing from you, thank you in advance for your help, and for the willingness to share your vast wealth of knowledge with us novice at home bakers!! Yes! 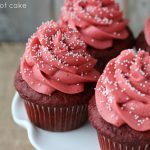 I also have red velvet cupcake recipes on the blog too if you want to compare them! 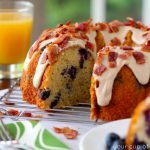 This bundt cake is dense, so if you want a dense cake, this is your recipe! Any thoughts on vanilla cream cheese glaze? 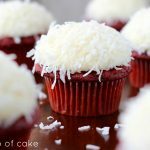 I can’t have red velvet without cream cheese! 🙂 This looks amaze and I’m planning to make for my dinner club dessert this weekend! Help! I don’t have butter milk! Can I use regular milk instead? What a wonderful recipe. I made one using my Nordic Bundt Pan, most beautiful and delish cake! 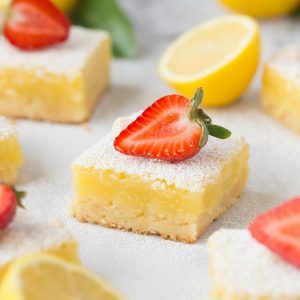 I used the same buttermilk-sour cream in a Lemon box cake mix using lemon instant pudding and a tablespoon of lemon zest. It too, turned out dense and moist. You have enlightened my baking Bundt Pan recipe file. I thank you! Does this need to be refrigerated if I’m making it for the next day? I can’t wait to eat it! Thanks! Made this cake for our family Christmas Eve dessert. It taste like homemade and everyone enjoyed it. The cake is very moist, not dry at all. So easy to make and mine actually looked like the picture. Will try the ingredients with other box cake mixes. This recipe is a keeper. Thank you for sharing. Made this last night. So simple and turned out wonderful. I wondered if you’re using the large or small box of pudding mix. Also, should a Bundt cake cool in the pan or should you take it out to cool. My question is: what size of instant pudding is used in this recipe? 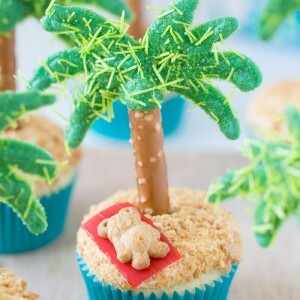 Will be making it this week for my son’s birthday! hi, do you cut the bottom of the cake to level up. mine got so high when baking and now i try to frost it, when turn over, it doesn’t look good. Hey there, can I add a cup of mini chocolate chips to the recipe? Since cake mixes come in different sizes (and so do pudding mixes) it’s really necessary to know what size to buy that will work with the other ingredients that do have measurements.